***She made us wait for two long months, but my dear sister Michelle has finally posted again. It's a heartwarming (brief) true-life drama that also offers suspense and a neatly-wrapped ending. Check out Home Tweet Home. And this just in! TWO posts in the same month?! Check out Lessons in ASStronomy, too. ***Ryan's brother, Brandon, is getting married tonight. (Mr.4444 and I will be there.) It's the family's first wedding. (Ryan would have been standing up, of course.) Gonna be a tough one for Molly and her family; I'm really glad we'll be there to support them. ***Check out this AWESOME gift idea, made by my very creative SIL, Karen. She made it for my SIL Mary Sue (a.k.a. 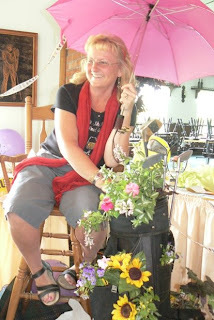 Merry Sue), who had a certain milestone birthday last weekend: In case you can't make it out, it's an old golf bag with flowers planted in every pocket. (Karen left a few clubs in it for accents.) Isn't it adorable?! ***Yaya needs your thoughts and prayers. She and her husband are hoping to be given the gift of becoming adoptive parents for these sibling kiddos: All positive thoughts and/or prayers are welcome!